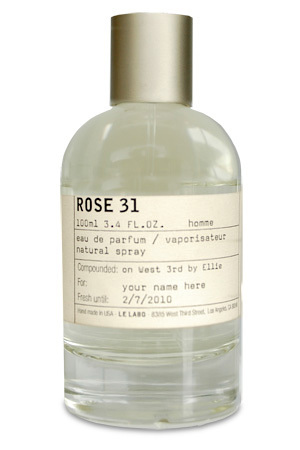 * Rose 31 starts spicy and fresh with a mix of cardamom, cumin, pepper, and cinnamon. * There is something in the top that also smells a little soapy, I am thinking it might be cilantro. * That soapy smell turns into a soapy rose which is cloaked by spices. There is also a slight, spicy carnation smell in the mix also. * Rose 31 never broadcasts Rose – it is definitely there, but you have to sniff for it. * A haze of rose lasts into the base which is all about spice and woods. Summary: The cliche here would be to reference Romeo and Juliet with a witty play on “A rose by any other name would smell as sweet,” but that’s just too obvious. Basically, if you are a guy looking for a rose fragrance that doesn’t scream rose, this one might be for you. There is rose there, like a delicate whisper softening the spices through the development. Le Labo scents are not inexpensive, so if you are looking at this one, I would also suggest looking at Amouage Lyric (another wallet buster) which is another masculine take on rose. Longevity is above average, lasting more than twelve hours. Be careful not to overapply this, especially during daytime – because it can scream. I could see younger guys liking this because the feels fresh and clean but with a spicy edge. Le Labo fragrances are available from Le Labo boutiques and website, LuckyScent and Barneys. I like Rose 31 but I agree that it might be overwhelming. But applied properly it’s wonderful. I don’t get any rosé out of this one. Lots of spices namely clove, coriander, nutmeg etc. word and musk. Rose 31 is a strong one when you first apply it. Then it gets warm and slightly sweet in the heart. Longevity is massive, lasting 24 hours. Very interesting scent though. Not sure about a full bottle though, my small decant is good enough thus far. I get the rose – but you have to hunt for it. It wears differently on me – sometimes its more present, sometimes its very hazy.